Ski season will be here before we know it, and the team at Valhalla Helicopters is doing our part to make it a great one! 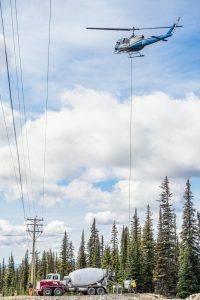 There are lots of ways to put helicopters to great use on a ski hill (we know you’re dreaming of some beautiful BC heli-skiing!). But even before the season gets underway, we’ve been hard at work in the skies above the slopes. Big White Mountain hired us to help install their new Powder Chair. As part of their extensive 2018 upgrades, the mountain is replacing the old triple chair with a new quad lift that will significantly increase uploading capacity, and allow easier access to some of Big White’s best skiing. In order to ensure that skiers and snowboarders reach the tops of Flagpole and Shaky Knees safely, those lift towers need to be secure! And that’s where we come in. 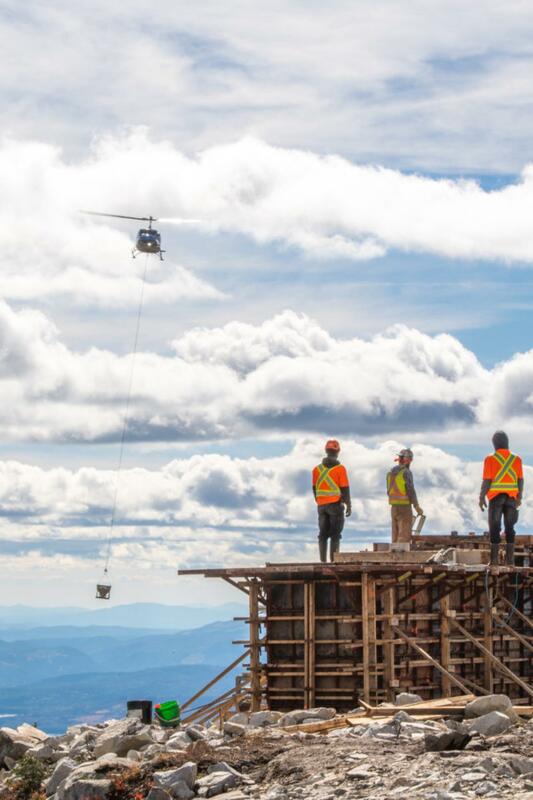 Recently, our intrepid leader, Blair Savege, was called in to maneuver his aircraft with incredible skill and accuracy to help create the cement footings for the lift towers. Transporting fresh concrete to the side of a mountain is…tough, to say the least. The large cement trucks can’t get up to those locations, and there’s no hose long enough to reach all of the towers. As a result, helicopters are commonly used to sling concrete to inaccessible spots. Getting the wet cement from the truck up the hill with nothing but a sling bucket is, in itself, a very difficult task. Once airborne, delivering that cement bucket to the waiting crew at the site is like shooting at a tiny, very distant target. Happily for the Big White management team and all future Powder Chair visitors, Blair is great at his job. 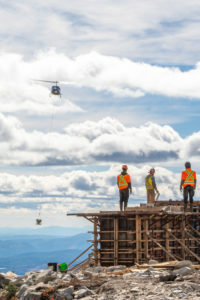 He managed to pilot the heli perfectly, and the new lift construction project went as smoothly as possible. The tower foundations are sturdy and strong, and the new technology has allowed for a little bit more elbow room down the slope –which means some pretty & challenging pockets have opened up under the new chair. All of the snow-lovers on our team are definitely looking forward to strapping on our boards and testing out the new and improved Powder Chair. We’re so glad we could help make it happen! 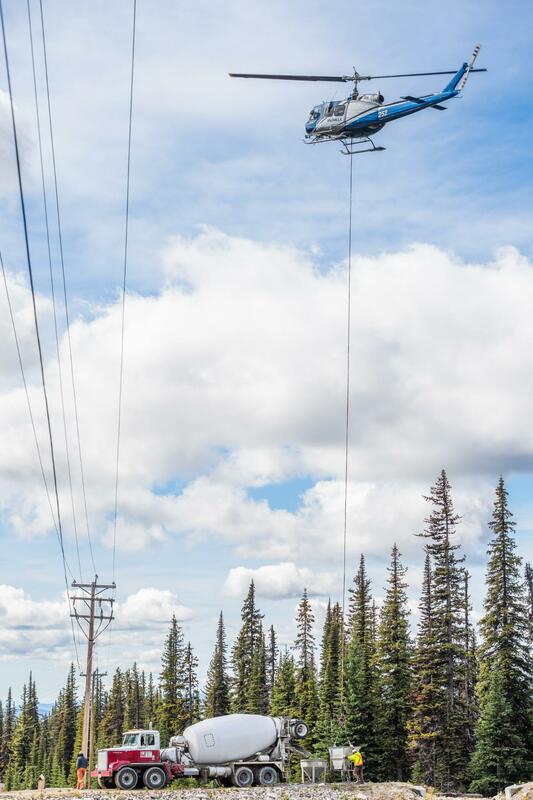 A big thank you to Big White for choosing Valhalla for such an important project. And now…bring on the snow (well, in the mountains, at least!)! There are so many interesting and technical things we can do with our machines! To learn more about Valhalla Helicopter’s commercial operations, contact our office.